Michigan, like other states, is in a transition phase of utility restructuring, with competition on an upswing. The number of alternative energy suppliers now serving customers increased by 10 in 2003, bringing the statewide total to 26. The number of customers choosing alternative suppliers nearly doubled in 2003, to more than 13,000 and 2,859 megawatts of electricity. The economic benefits of competition are tangible. “By allowing small businesses to choose lower-cost electric providers, this law has preserved the equivalent of 20,000 jobs since it was enacted four years ago,” said Rob Fowler, president and CEO of the Small Business Association of Michigan. 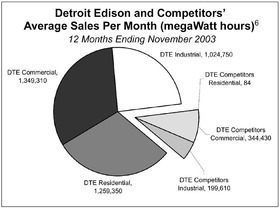 In the Detroit Edison service area, alternative power suppliers now account for about 20 percent of commercial sales and 16 percent of industrial sales. Over the past 12 months, the number of customers opting for alternative suppliers grew by 100 percent, while the amount of competing supply of electricity grew by 60 percent. In the Consumers Energy territory, alternative power suppliers account for about 7 percent of commercial sales and 16 percent of industrial sales. Over the past 12 months, the number of customers opting for alternative suppliers grew by 75 percent, while the amount of competing supply of power grew by 47 percent. Very few residential customers have opted for a competing supplier. This is not surprising, however. Lawmakers in 2000 mandated a 5 percent rate cut, which reduced customers’ incentive to seek service alternatives. More important, residential rates have been kept artificially low by the imposition of higher rates on commercial and industrial customers. Meanwhile, new entrants in the power market have targeted their marketing efforts on large-volume purchasers, the better to gain a foothold in the market. Residential customers do benefit from restructuring, however. 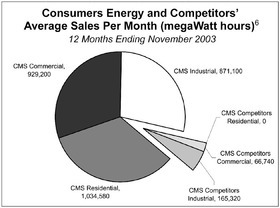 Competition exerts downward pressure on electricity rates, which helps to limit increases in the prices of products and services. Critics of competition claim that new entrants are “cherry picking” high-volume customers. But targeting the most profitable customers is standard strategy for new competitors in any market. For example, the most successful start-up airlines, such as JetBlue and Southwest, first offered service on high-volume routes between major cities before expanding into smaller markets. Similarly, satellite television services like DirecTV were launched in the mid-1990s as high-end services before being marketed as a standard alternative to cable. There are significant rate variations among power suppliers. Some Michigan manufacturers report savings of 15 percent to 20 percent from opting for alternative service providers. Michigan public schools and universities are likewise turning to new suppliers to cut energy costs. More important, perhaps, is the investment in new generating capacity in Michigan spurred by Public Act 141. The Public Service Commission has identified at least 15 new facilities in the planning stages or under construction that, if completed, would add nearly 12,000 megawatts of new generating capacity in the state — or about four times the amount currently provided by alternative suppliers. 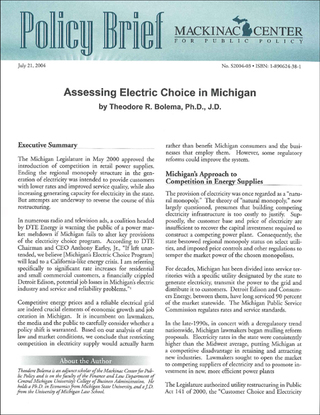 Based on the increased competition in power supply, utility restructuring in Michigan is progressing on course. To claim failure now would be unwarranted considering the consumer and economic benefits that restructuring has produced.